It's that time of year when you may take a look around your home and decide it's in dire need of a little TLC. Nope, not "No Scrubs" blaring from the CD player (not that TLC!...) but an actual spruce up or refurb' of your dwellings. The truth is, when the sun is shining, suddenly everything looks different - what might have looked warm and cosy in the winter months, perhaps now looks dark and tatty in the sunshine. Maybe you have just moved into a new place and need some inspiration on how to put your own stamp on it as they say and make it your own? Or maybe you have a room that is just in need of updating. Well, I don't claim to be an expert on interior design but as mentioned before, I do have a real passion for it and not too long ago, (with the help of my lovely dad!) refurbed and redecorated the whole of my two bedroom house from scratch. With any project, no matter how big or small, research is the key and I did tons of this! ....and lots of them! 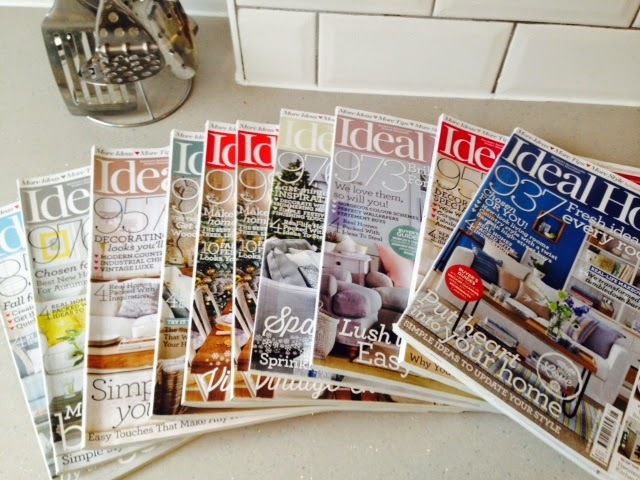 My magazine of choice for great ideas and designs was 'Ideal Home Magazine'. 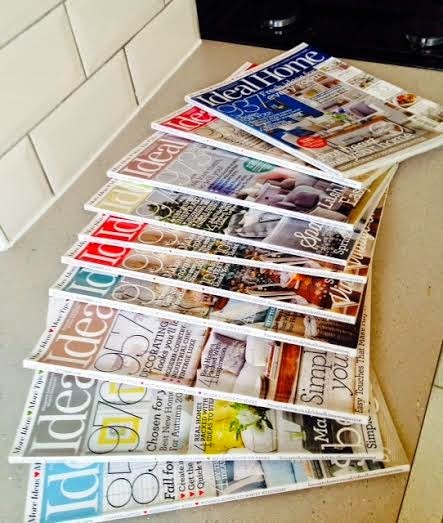 I found this particular mag to have lots of brilliant items that were not 'run of the mill' see them everywhere products..i.e Ikea...(don't get me wrong, Ikea is great for some everyday items, but for me I wanted some things in my home that were a little less 'off the peg' and more original). Another thing they do well is show items from both ends of the budgetary scale. Living etc. 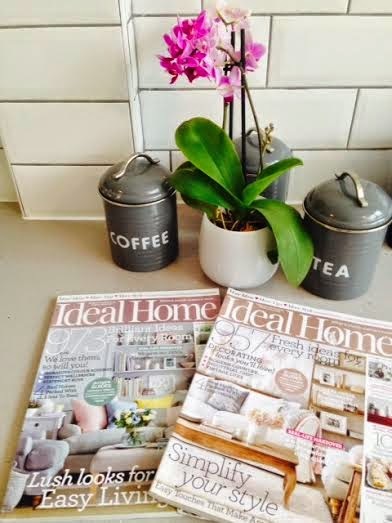 and Home & Garden are other great magazines that I sometimes buy, but they tend to have more high end products, which is great for inspiration but depending on your budget not for everyone. 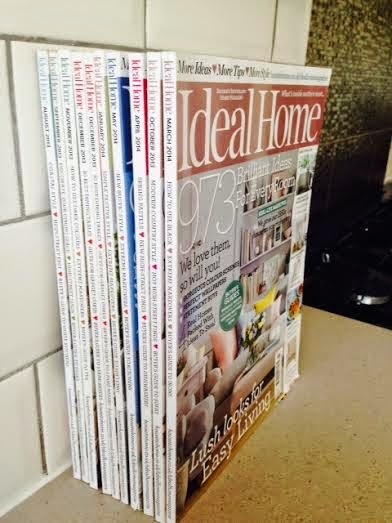 Namely, the Ideal Home Exhibition which is on twice a year at Earls Court in London. I have been to several of these - they really do give you ideas and a chance to see up close and personal any of the big ticket items you may be thinking of buying and a chance to see the retailers and try out products. I love seeing all the outdoor furniture including the amazing wooden garden huts that are always beautifully presented and dressed with twinkly lights. There is also always lots of big discounts and special show offers. SMEG always have great discounts on their appliances at the show, but be prepared to get there early as quite often you will see 'Sold' signs stuck up as people have got their early and snapped up all the great deals! If you have got a big renovation to do than The Grand Designs Exhibition is a another great one, as you get to meet lots of suppliers and retailers all under one roof. You'll be surprised how many amazing online retailers there are when it comes to your home. 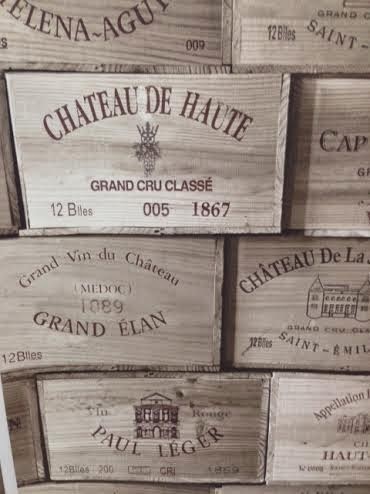 When you cut out the middle man and buy in some cases direct from the warehouse/supplier the discounts can be huge! For my house, I wanted white floorboards for my bedrooms upstairs and the landing. Even though once we pulled the carpet up my original flooring was ok, it would have been a lot of work involved to strip, sand it down and then paint it (not including the maintenance). So after scouring the usual places (B&Q, Homebase etc) and not finding exactly what I wanted, I searched online and found this gem...UK Flooring Direct which have every variety of flooring you could possibly want including solid wood. The discounts are great and what's even better is that you can request free samples before ordering so you can see and inspect the colour up close. I loved this site and chose a grey/white floor for upstairs and a dark walnut for downstairs. The quality is great and I always get compliments on it. Other great online retailers are Made.com for unique furniture, MelodyMaison.com for french style shabby chic. I wanted white shutters for my front windows...I love the look of colonial, plantation shutters and although they are traditional, I feel it gives a modern and stylish look. So many people now are negating to put up net curtains feeling that the look of 'nets' is old fashioned, preferring instead to have an open bare window. 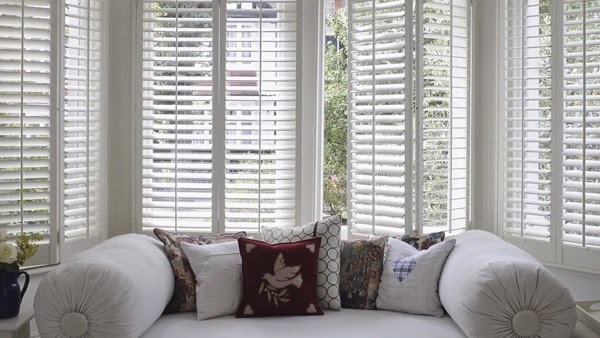 For me though, the need for privacy is more pressing and when I am able to afford shutters I will get them fitted (they are quite expensive as they are made to measure...especially as I have bay windows which raise the price even more!). If you are thinking of getting shutters, get lots of quotes to compare. I think I had about four, which included Appeal, Thomas Sanderson, Hillary's and Shutterly Fabulous. There are lots of companies on the market offering this service so the competition is quite good. Something to be aware of though with wooden ones which I didn't realise until I started researching, is the maintenance required. After about 5 years they will require repainting and after about 10years you will probably need new ones fitted. You can get UPVC shutters which mean they are more durable and most come with a 25 year guarantee - you can hardly tell the difference, but if you're a purist (like me) or are purchasing shutters for the look and feel of real wood than you probably will not like the UPVC. I have no wallpaper in my house...a few years ago this would've been unusual but now more and more people are opting for painted walls only. For me, I wanted the flexibility of being able to change my soft furnishings whenever I wanted to without worrying whether it 'went' with the wallpaper! Wallpaper can be very restricting in that manner, however a feature wall in wallpaper is probably a bit easier to work with. It all boils down to personal taste and what you are looking to achieve in your home. Again for me it was all about the paint and I love Fired Earth and Farrow and Ball for their muted, English heritage colours. I have just brought Lichen from Farrow and Ball, a grey/olive green colour for my chimney breast downstairs and Dix Blue for a stripe effect project that I am really excited to start on my upstairs landing (I will post pictures when I have completed this!). Fired Earth Ultramarine Ashes is a beautiful sea green colour that I have on the chimney breast in my bedroom. See here for more of this type of illustrative wallpaper from B&Q. Ok, well I hope I may have inspired you or at least given you some direction in where to start with any home decorating. With any project, my main tip is just to take your time and don't rush into any big buys....and always get a second opinion if you are unsure of anything...let me know how you get on!